"The circus is in town. Big, burly men erect the big top, winching the tall tent poles into place and driving the stakes and pulling the canvas taut into a cathedral that ripples in the wind. The audience arrives, and watches the performers and animals enter the center ring: a lion, a playful chimpanzee, an elephant. A Strong Man whose muscles bulge on cue. A beautiful showgirl in a feathered headdress. Acrobats, aerialists, clowns, jugglers. And a ringmaster, the manager of the circus who likes to sneak whiskey from a flask and who tightens his belt around his pot belly when he puts on the top hat to enter the ring. In a corner of the tent, a shy Man runs the concession stand, selling sodas, popcorn, cotton candy. As the show starts, he stands at attention, ready to serve his customers. And daydreams a bit. Soon, a dog sneaks in and befriends him, begging for snacks and affection. He likes the dog, but is called away for his other job—cleaning up after the animals. The ringmaster doesn't like the dog, and beats him. The Man cares for the dog. A Woman, one of the aerialists stops by after her act, riding on the handlebars of a bicycle over a tightrope. She likes the Man. They flirt. But the ringmaster, now a little drunk, likes her, too. He sees her at the concession stand, grabs and gropes her. The ringmaster grows more insistent, but the Man comes to her rescue. They fight. The Woman runs. They scramble into the big top just as the knife juggler climbs onto his unicycle. A chase—the Woman running from the ringmaster; the Man trying to save her. Up onto the aerialist platform, high above the center ring. The audience watches, rapt. The ringmaster is drunk, wielding one of the juggler's knives. The Man and the Woman are cornered on the platform, but escape across the tightrope, pursued by the ringmaster. When all hope is lost, the Man remembers his friend, and whistles for the dog. 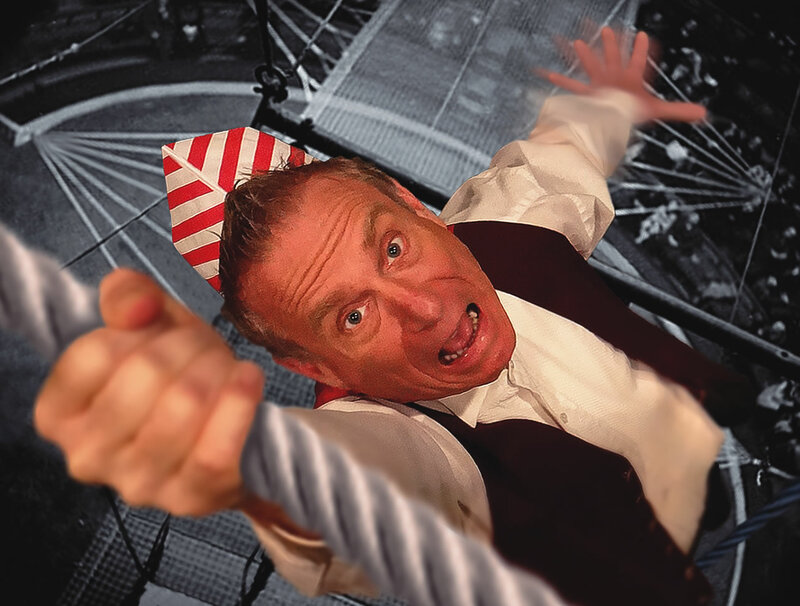 He sprints to the rescue, as the rest of the circus performers form an acrobat's pyramid and vault him up to the high wire. He bites the Ringmaster, who falls into the bucket of animal dung. The Man and the Woman are saved. The audience applauds. They wave and leave the center ring, hand in hand. It's a good, old-fashioned story, the kind that might be told in a Buster Keaton silent, or perhaps a Saturday morning Looney Tunes. But here, it's all told by David Gaines. One man. On a bare stage. Without words. Imagine that. It's a tour de force of storytelling and physical theater, imbued with wit, hilarious physical humor, and even a few touches of genuine pathos. Gaines is an extraordinary theater artist. He sets up the storytelling language early on, switching between characters with a quick pirouette, setting scenes with a looky-here whistle and a few gestures, using grunts and gibberish to suggest dialogue without actually speaking any words. It's dazzling. " -	BY PAUL KOSIDOWSKI 11/15/2013 "